With just a few weeks to go until Halloween, I’ve prepared a little care package for my favorite preschooler, my goddaughter Maureen. She’s mildly allergic to cinnamon, so the pumpkin chocolate chip bread I’m sending will really be for her parents, and while I would’ve liked to have sent her some pumpkin-shaped sugar cookies, they’re not quite as sturdy for shipping. 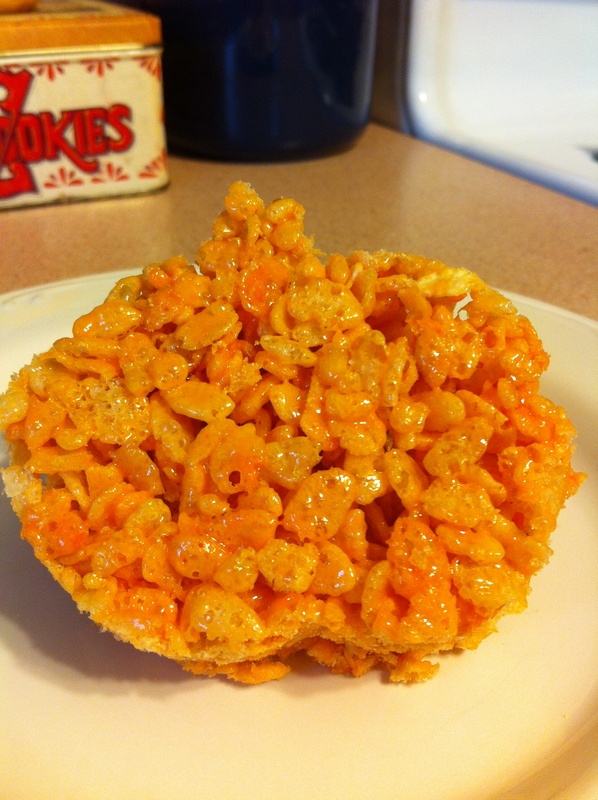 These Rice Krispie pumpkins are a good alternative, as they can be packed in an airtight container with little risk of breakage between Pittsburgh and southern Maryland. My Rice Krispie treats use a high marshmallow-to-Krispie ratio, as I like a softer treat, but you can use an additional cup of Krispies if you’re after something a bit sturdier. I’m hoping that they’ll stay fresh during the few days they’ll be in transit! If you’re not shipping your treats, you might consider adding some frosting or melted chocolate embellishments to make the pumpkins look like Jack-o-Lanterns. You could also gently press in some candy corn or other Halloween-related candy into the tops of the treats and simply cut them into bars if you like. Spray a 9 x 13 pan with nonstick spray; set aside. In a large pot, melt margarine over medium heat. Add marshmallows and stir until completely melted; add about 15 drops of yellow food coloring and two drops of red to achieve your desired orange color. Add Rice Krispies and stir until completely coated with marshmallow mixture; immediately pour into your prepared pan and smooth out using a spatula. Allow to cool completely, then turn out onto a sheet of parchment. Spray a pumpkin cookie cutter with nonstick spray and cut; reshape scraps and cut again, or hand-form into pumpkins.